In October last year, Lieutenant-Colonel Tony Streather passed away at the age of 92. Although not well known by today's mountaineering fraternity, his approach and accomplishments were impressive. An obituary by Ed Douglas can be found here. "Tony Streather, the first person in the world to climb two 25,000 ft peaks, has died. The two peaks – both first ascents – were Tirich Mir and Kanchenjunga. He was also, apart from Dee Molenaar, the last surviving member of the heroic 1953 K2 expedition, and he was the reluctant leader of the ill-fated 1957 Haramosh expedition. On the 50th anniversary of that 'Last Blue Mountain' expedition we spent a very enjoyable couple of hours having lunch in his local pub, as I interviewed him for a piece in the Sunday Times. Enjoyable but also sad - fifty years on the psychological wounds were still there. The piece is pasted below, for anyone interested. 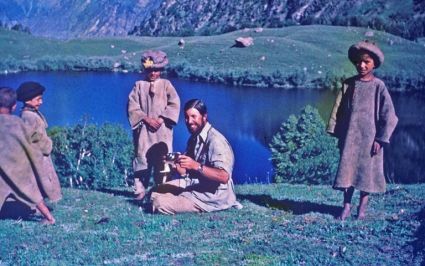 The photo above shows Tony during the Haramosh expedition, happy to be back in his beloved Pakistan. Haramosh was a very ambitious target for the Oxford University Mountaineering Club. Rising to 24,270 feet in the Karakoram range of northern Pakistan, the virgin peak was unlikely to succumb to four young students, however determined. On the afternoon of 15th September 1957 when three of them crested a ridge at about 21,000 feet and saw the huge gulf still separating them from the summit, their older leader, an army officer called Tony Streather, was adamant that it was time to turn back. And that would have been that – a commendable accident-free ‘reconnaissance’ – if twenty-three year old Bernard Jillott had not demanded to carry on a little bit further, just to see over the next crest. Streather agreed reluctantly, staying with the young New Zealander called Rae Culbert while Jillott ploughed ahead, roped to medical student John Emery. Jillott led forcefully, kicking steps in deep soft snow, keeping well clear of the treacherous cornice – an overhang of windblown snow, bulging out over the huge precipice on the left. To the right the slope curved out of sight, disappearing 8,000 feet down the immense north face of Haramosh. It seemed an innocuous enough slope until the two men suddenly, inexplicably, crumpled over. Watching a bizarre puppet dance of waving arms and legs, Streather thought for a moment that Jillott and Emery were larking about. Then he realized that the whole surface was moving, taking the two men down the convex slope. They disappeared. There was a moment of silence, then a loud roar as the avalanche erupted over an ice cliff, flinging them down the 8,000 foot wall. Once they had recovered from the first terrible shock, Streather and Culbert climbed a short way down the convex slope, now swept clear to old frozen snow. It was really just a token gesture, a formality, but as they peered down the precipice they were astounded to see first one, then another tiny figure emerge from a pile of snow and stand up. Jillott and Emery had halted miraculously on a ledge. Against all the odds, they were alive, but they were stranded without food, water or shelter in a remote snow basin, possibly injured, one thousand feet below the ridge. Streather and Culbert knew immediately that they had to go down into that basin and rescue their companions. What they didn’t know was that the accident they had just witnessed was merely the prelude to a tale of compounding misfortune, catastrophe and heroic sacrifice almost unparalleled in the history of mountaineering. Tony Streather is now eighty three. He lives in a terraced cottage in the Wiltshire village of Hindon, surrounded by photos of his wife Sue, who died last year, together with his children and grandchildren. There are also regimental pictures and photos of the famous mountains he once climbed. Based in Pakistan with the Chitrali Scouts and fluent in Urdu, he was appointed transport officer to the Norwegian Tirich Mir expedition in 1950 and ended up going to the summit. In 1955 he reached the world’s third highest summit Kangchenjunga. In between those successes, in 1953 he was with the Americans on K2, getting close to the summit before taking leading part in a heroic, doomed attempt to get a sick companion down from 26,000 feet in a storm. It was after lecturing on K2 in Oxford, four years later, that the university mountaineering club collared him. ‘They got me into a bar, plied me with several whiskies, then approached me to ask if I would lead their expedition to Haramosh. The Himalayan Committee would only give them the necessary support on condition that they had an older more experienced leader. I suppose they got me at a vulnerable moment and I said “Yes, fine.” I was not long since married, with a very small child, and I should probably never have done it. Very irresponsible. But it was not long since I had left Pakistan and it was very tempting to go back and see old friends.’ And so the Streathers’ army bungalow in Camberley became expedition headquarters, visited each weekend by the four students. Wrapping supplies in old pages of the Telegraph, the forestry graduate from New Zealand, Rae Culbert, joked about the lack of more liberal reading matter. Easy-going, thoughtful and generous, he seems to have been liked by everyone. John Emery, who had delayed medical finals at St Mary’s Hospital in London to join the expedition, was quieter, but Streather also liked him very much. He was less keen on the American, Scott Hamilton, who was a brilliant fund raiser but proved completely out of his depth on the mountain. And he had an awkward relationship with the grammar school boy from Huddersfield who had instigated the whole project, Bernard Jillott. ‘Bernard was the driving force – very ambitious, very efficient, very busy. Everything he had done, he had always finished at the top. Without being snobbish, he was from a working class background. I got on with him alright, but I think he found me a bit conventional.’ One can understand all too easily the frustration of this talented young Yorkshireman forced to act deputy to the moustachioed officer with the plummy voice. But the friction wasn’t just about class, as Streather explains. ‘I tried to share the leadership as much as possible, but he was very impulsive. And that was dangerous, because his decision making could be influenced by that impulsiveness.’ On 3rd August 1957, the five men reached base camp in the Mani valley, a few day’s journey from Pakistan’s northern outpost of Gilgit. Looking up from their grassy meadow at the summit of Haramosh, 12,000 feet above them, it was immediately obvious that any attempt direct on the gigantic north face would be suicidal. Instead, with the help of five local men from the Hunza valley, they worked their way up a long flanking movement, thwarted by frequent heavy snowfalls. Often the men were confined to camp. On 8th August Streather wrote in his diary, ‘Spent most of the afternoon reading. I thought a lot about Sue and the baby and missed them even more than usual.’ On the 21st he noted, ‘storm all day’. On the 26th, he noted, ‘Weather bad all day. Found Bernard particularly trying.’ On the 9th of September, he wrote, ‘Terrible night. Tents completely buried. Not much food now. Bernard completely ineffective.’ Then the weather finally improved. On the night of the 14th Culbert, Emery, Jillott and Streather slept at Camp 4, at 20,000 feet. Hamilton had agreed to wait down at Camp 3, until they returned from their reconnaissance. The following morning the Camp 4 team got away at 11.00 am and by three o’clock that afternoon they had reached their highpoint at 21,000 feet, rewarded by the kind of dazzling vistas which make all the backbreaking toil seem worthwhile. And then, half an hour later, Emery and Jillott were swept down into the snow basin. Streather and Culbert had to act fast. First they threw down a rucksack with warm down jackets and food, but it shot past the two men below and disappeared into a crevasse. However, their were more supplies down at Camp 4, so they returned there to collect two thermos flasks, food, warm clothing and rope. Then they climbed back up the route which had taken them four hours that morning. By the time they were back at the accident site it was already dark, but by with the help of a good moon, they were able to climb down into the basin, eventually realizing that another day had dawned and that Emery and Jillott were shouting urgently to them to avoid the huge ice cliff they had been swept over by traversing several hundred feet right, to a point where the cliff petered out. The traverse was steep, with thin snow overlaying brittle ice, and Streather had to cut steps with his axe all the way, foot by foot. Towards the end of the traverse one of Culbert’s crampons – the vital metal spikes strapped to each canvas overboot – fell off and disappeared into the void. It was late afternoon by the time they reached Emery and Jillott, who were uninjured but weakened by cold. They had also lost their ice axes in the avalanche. Although it was late, Streather decided that they should start to climb out of the basin straight away, that evening. He led the way, bringing the others up on the rope, but Culbert slipped on his cramponless left foot and pulled them all back into the basin. They tried again, but this time Jillott fell asleep on a ledge and pulled them all off again, tumbling back into the basin, where they all spent another night in the open. They tried again on the 16th and this time all four men succeeded, despite exhaustion and frostbite, in climbing up the initial slope and across the laborious traverse. But traversing on ice is very hard, especially if on one foot all you have is the rubber sole of your frozen leather boot. Culbert tried heroically but eventually came off, swinging in a huge pendulum, ripping Sreather from the ice and hurtling back down the same cliff over which Emery and Jillott had tumbled two days earlier. As if in some horrible cosmic joke, roles had ben reversed, and the rescuers had now become the victims. While Emery and Jillott continued through the night, climbing back up to the ridge, Streather and Culbert shivered through another night in the basin. By the morning of the 17th Culbert was very weak and so frostbitten that he had lost all sensation in his feet. Streather had lost his ice axe, so knew he couldn’t possibly hold the younger man, so he didn’t bother to rope up as they set off out of the basin for the fourth time. Culbert tried to follow, but kept sliding back down. He never complained, but just shouted up, ‘What shall we do?’ Streather, shouted back, ‘Hang on where you are. The others are sure to be back soon.’ But the others didn’t appear, so Streather just had to keep climbing on his own. Having lost his ice axe, he had to scoop with a frozen canvas mitten, excavating powder snow from the steps he had cut two days earlier, teetering across the traverse, until he finally regained the ice axe where he had fallen the previous afternoon. Even with his ice axe, the final slope back to the ridge was purgatory. Recalling it fifty years on, he says, ‘I thought I was dead and I didn’t know why I was climbing, but I just knew I had to keep moving, for Sue and the baby. I had this incredible feeling that someone was helping me, pulling me out of a well. And eventually I reached the ridge, where we had left a rucksack. I scooped up some glucose tablets with my frozen hands and mushed them up with some ice, then carried on down to Camp 4, as there was no sign of the others.’ The route down to the camp was complicated and at one point the tracks went straight over an open crevasse. Streather just managed to throw himself over. Lower down he was puzzled by one track diverging to the right, but he followed the correct to the camp, where he found Emery lying, fully clothed, with his cramponed feet sticking out of the tent. When Steather asked where Jilliott was, Emery blurted, ‘he’s gone.’ ‘What do you mean –gone?’ asked Streather. ‘He’s dead. Over the edge.’ Streather immediately understood the diverging track. Racing down in the dark, desperate to reach camp, Jilliott had strayed over a precipice, to fall several thousand feet down the south side of the mountain. 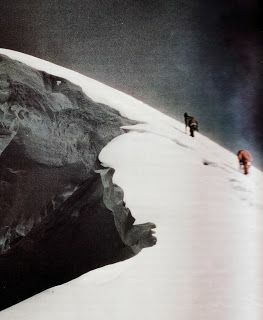 Meanwhile Emery had fallen in a crevasse and only escaped that morning, reaching camp just a few hours before Streather. Now Steather got the stove going, to melt pan after pan of snow, desperate for liquid. Emery the doctor gave them both penicillin jabs, to protect frostbitten hands and feet from infection. And they talked about going back to rescue Rae Culbert. But the following morning they realized it was impossible. Fifty years on Streather is still wracked by regret. ‘I tried getting out of the tent, but I couldn’t even stand up. In the end I had to use ski sticks. John was even weaker and I realized that we were incapable of going back. In any case, Rae was almost certainly dead already, after another night in the open. If we had gone back, probably no-one would have survived. As it was, we had a terrible struggle getting down to Camp 3 and when we got there Scott Hamilton was too shocked to be any use. We had to make all the decisions and do everything ourselves.’ It took them four days to get down to base, before they could send telegrams home to the families of Bernard Jillott and Rae Culbert. Back at St Mary’s Hospital in London, John Emery had to have all his fingers and toes amputated. But the surgeons left enough of a thumb and first finger stump for him to hold a pen and get a first in his medical finals. Soon he was climbing again, but in 1963 he died in fall in the Alps. Streather got away without amputations. But he still had to face the families of the young men who had died. ‘The Jillotts didn’t want to have anything to do with us, and that was very hard. But with the Culberts it was very difficult and I’m still in touch with Rae’s brother – very artistic chap, who was studying at the Royal College of Art.’ I managed to track down Bill Culbert, who at 72 still works full time as a sculptor in the south of France. Approaching the fiftieth anniversary of the terrible day when the news came through, the emotion is palpable down the telephone line. ‘Rae was super and he looked after me. I used to work with him at forestry in the summer holidays. He was very strong, very philosophical and he just loved people. He would have had a brilliant career. Everyone liked him.’ I asked whether he or his parents had ever felt resentful about Haramosh. Or about Tony Streather? ‘No,’ he replied. ‘Tony’s a wonderful person and we’ve seen a lot of him over the years. What he did was amazing and there was no question of going back into that basin. There was nothing more they could do.’ Streather still, inevitably, wonders whether the whole disaster could have been averted. ‘Perhaps if I had been stronger, I could have stopped Bernard going up that last slope. But he was determined, and I couldn’t physically stop him.’"
Many thanks to Stephen Venables and the Sunday Times for granting us permission to reprint this article. Retroscopes are dangerous tools... RIP.